Heat the oven to 200 C and line a 12-hole muffin tin with paper muffin cases. Halve 175 g rhubarb lengthways and dice it. Put it in a large bowl and stir with 175 g sugar. Set aside while you make the crumble topping: in a separate bowl, mix together 50 g light muscovado sugar with 50 g plain flour, 25 g porridge oats (or rolled oats) and 1 tsp cinnamon, then rub in 50 g butter with your fingertips until clumpy. Back to your sugary rhubarb (don’t worry if it became a little bit juicy). Stir in 2 tbsp sunflower oil, 1 egg, 1 tsp vanilla extract and 125 ml buttermilk (if you don’t have buttermilk, just add regular milk and a squeeze of lemon juice instead). Now, add 2oo g plain flour, 1 tsp baking powder and 1 tsp bicarbonate of soda and stir well. 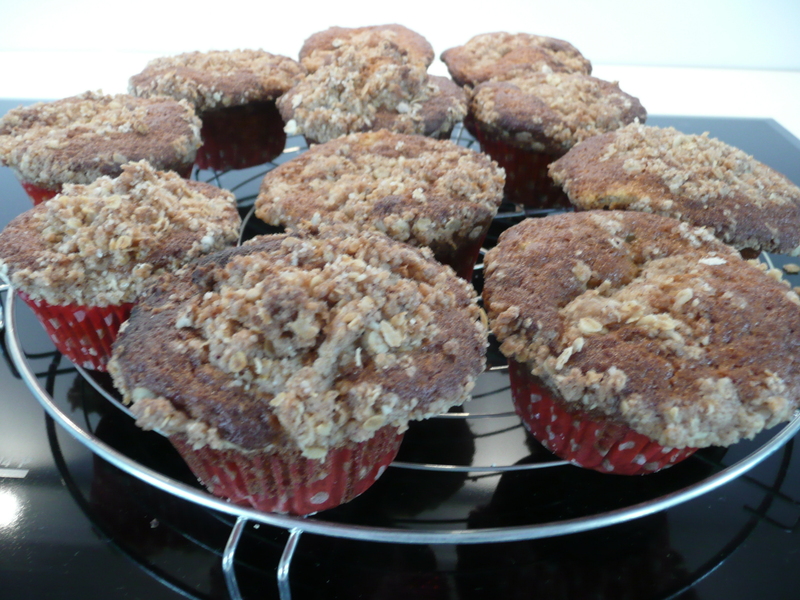 Quickly spoon into the cases, then scatter each with a thick layer of the crumble mixture. Bake for 15-18 min until golden and a cocktail stick poked into the centre of a muffin comes out clean. Leave to cool in the tin for 5 min before transferring to a wire rack to cool completely. If you don’t plan to eat them all in a matter of days (perfectly feasible though), you can wrap them one by one in tin foil and freeze them. Just take one straight from the freezer in the morning to take to work for example and it will be ready to eat by lunchtime. Enjoy! Contrary to me, my brother is not a dessert kinda guy. So when I was recently invited for a delicious barbecue, I knew that dessert would not be part of the menu so I brought the solution myself! And my brother absolutely loved and didn’t object at all to keeping the left-overs! I found this recipe in a recent issue of Olive magazine that I got as part of my birthday present from a friend. First, make the base by crushing 200 g digestive biscuits (I used petit beurres). Stir in 50 g ground hazelnuts (I used almonds instead) and 125 g melted butter. Line the base of a 23 cm spring tin with the biscuit mix and pack it well with the back of a spoon or just use your hands. Butter the sides and chill in the fridge for half an hour while you make the filling. Heat the oven to 140 C. Whisk 90 g caster sugar with 300 g soft cheese (I used “Campina De Brabander”). Separate 2 eggs and slowly add the egg yolks one at the time to the cheese mix while whisking all the time until combined. Whisk in 300 g soured cream. If you don’t have sour cream, you can substitute for more soft cheese, but be sure to add the juice of half a lemon as well in that case. I didn’t have enough sour cream so I used 200 g soured cream, 400 g soft cheese and a squeeze of lemon juice instead. In a clean bowl, whisk the two egg whites with a pinch of salt until stiff (you need to be able to turn the bowl upside down and keep it over your head, and this is not a joke! If you can’t do that, keep beating!). Add 85 g caster sugar a spoonful of the time, whisking between each addition until stiff and glossy. Mix the meringue into the soft cheese mix, you can be quite vigorous so don’t worry about knocking the air out. 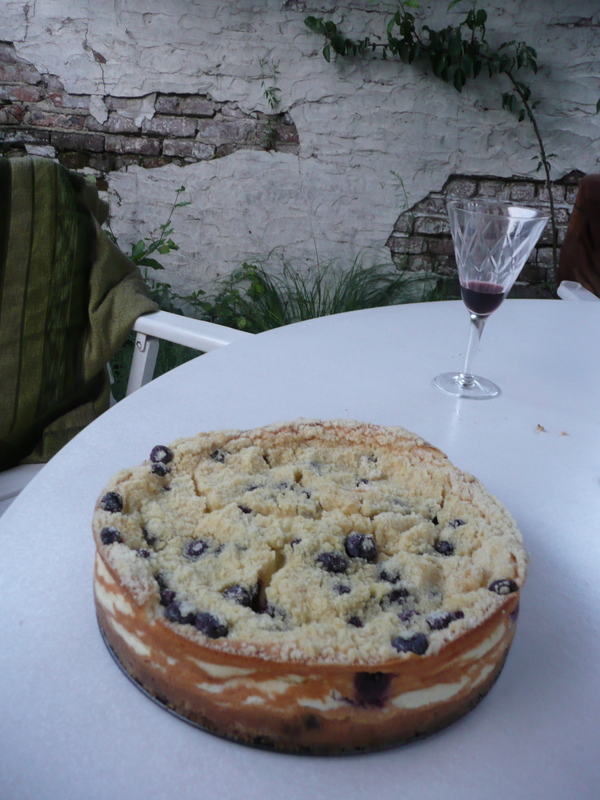 Pour a good layer of the cheese mix on the biscuit base and drop in a few blueberries (you need 200 g blueberries in total, save half for the crumble). Repeat the process until all the mix and 100 g of the blueberries have been used. Cook in the oven for 20 min. In the meantime, make the crumble topping by whizzing 100 g plain flour in a food processor with a pinch of salt and 50 g chilled butter until it resembles breadcrumbs. Toss with 50 g sugar and the remaining 100 g blueberries. After 20 min, gently take the cheesecake half out of the oven and scatter the crumble mix on top. Return to the oven and bake for another 40 min. If it’s still too wobbly for your liking, leave to cool the cheesecake in the oven, otherwise take it out and leave to cool completely in the tin before serving (don’t worry if it cracks, the crumble will mask it). Enjoy!